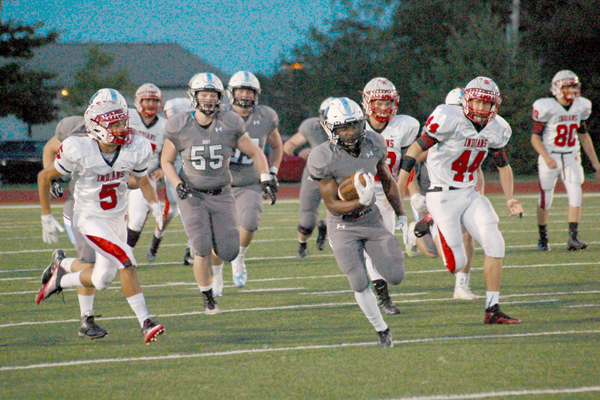 It was a “name your score” game for the Shawnee Mission East Lancers o their senior night when took on Shawnee Mission North Friday September 30. East scored each time the touched the ball in the first half, and won the game 77 - 26. The Lancer’s forced a three and out on North’s first possession. A penalty on the punt return was the only setback for East all night. The Lancers scored on their first play from scrimmage. Nigil Houston took the handoff off tackle to the right side and bounced it to the sideline, and 80 yards later he was scoring East’s first touchdown of the night. The Indians were stopped on fourth down on their next possession. East took over at SMN’s 28. Two plays later Houston scored another touchdown from 15 yards out on his second touch of the game. After only three plays East was up 14-0. The third time was the charm for North, as their offense moved the ball down the field on their next possession. Will Schneider expertly navigated the East defense with a combination of short throws and runs. Schneider capped the drive off with a one yard plunge. A two point conversion cut the lead to 14-8 with 3:35 left in the first quarter. That’s when the flood-gates opened. East would score touchdowns on their next two plays. First, was a 60 yard bomb to senior Trevor Thompson. Quarterback Luke Kaiser rolled to his right and launched a perfect pass down field. Thompson and the defender both went up for the ball. The receiver was able to keep his concentration and haul in the catch even after a deflection by the Indian and bobbling the ball himself. A bad snap on a punt set up East’s next touchdown. Houston scored on the next play from nine yards out. With 1:28 left in the opening quarter the score was already 30-8. After another Lancer touchdown, North found some success. This time it was Marcos Garcia. Garcia put all thoughts of a hamstring injury behind him and ran hard all night. Halfway through the second quarter senior running back took a handoff up the middle for a 25 yard touchdown making the score 38-14. Shawnee Mission East would had four touchdowns before halftime including two in the final 47 seconds. The Lancers took a 70-14 lead into halftime. The second half saw East empty its bench. Combine that with a running clock and North outscored the Lancers 13-7 in the second half. North looks bounce back vs Leavenworth and Shawnee Mission East takes on Olathe East.